The Virgin Islands Housing Authority (VIHA) is a public housing corporation that operates under the provisions of the U.S. Housing Act of 1937, as amended, the Quality Housing and Work Responsibility Act of 1998, and the Virgin Islands Code. The birth of VIHA dates back to 1941, when the municipal councils of both St. Thomas/St. John and St. Croix passed an ordinance creating municipal housing authorities in a single agency, the Virgin Islands Housing and Redevelopment Authority (VIHRA), with tri-island jurisdiction. In 1962, Act No. 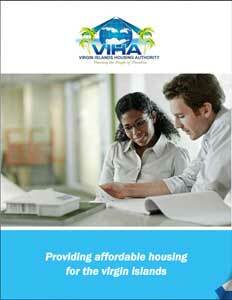 903 of the Virgin Islands Legislature established the agency as the Virgin Islands Housing Authority. While the Government of the Virgin Islands is obligated to provide municipal services such as schools, police and fire protection, garbage collection, road and street light maintenance, and water to the residents of public housing, VIHA’s main service to its residents is to administer the three main programs by which HUD funds affordable housing in the U.S. and its Territories: Public Housing, Housing Choice Vouchers, and Section 8 Assistance. Public Housing was established to provide decent and safe rental housing for eligible low-income families, the elderly, and persons with disabilities. Public housing comes in all sizes and types from efficiencies, to scattered single family houses, to high rise apartments, to one-bedroom units for the elderly. There are approximately 1.2 million households living in public housing units in the U.S., managed by some 3,300 Housing Authorities (HAs). HUD administers federal aid to local HAs which manage the housing for low-income residents at rents they can afford. While Public Housing Funds go to the individual HAs, both for capital improvements and for their day-to-day operations, Housing Choice Vouchers are a form of monetary assistance that go to very low-income individuals and families so that they can rent, lease, or purchase safe, decent, and affordable privately-owned housing. Finally, HUD also provides what is known as Section 8 Assistance for Public Housing Relocation/Replacement. Section 8 vouchers can be allocated to public housing tenants who are forced to move because of the rehabilitation or demolition of their public housing unit, allowing them to relocate into privately-owned housing and still pay affordable rent. This assistance helps make the demolition of obsolete public housing projects possible, while supporting displaced residents. WHERE: St. Thomas and St. John, U.S. V.I.